updating and renovating a small Bungalow DIY style. This spring I was contacted by the editors of This Old House Magazine about a possible feature of Ittybittybungalow in the September issue. I’m thrilled to report that the house was shot this summer, then an article was written and included in this month’s edition of This Old House Magazine. All of the images from the magazine can be seen here and the write up can be read here. In addition, if you so happen to like any of the items you see in the photos you can head over to Wayfair.com where you can purchase similar items (this is very cool, but also very weird, I must admit). The article is well written and kinda funny. Essentially, for the first three paragraphs my parents make fun of me – so enjoy. I can’t tell you how shocked I was at how seriously the staff at This Old House take their job. The writer, Deborah Baldwin and I spoke over the phone for several sessions and for nearly and hour each time. In addition, a fact checker confirmed every detail with me after the article was written as well as confirmed every measurement on the floor plan. The photo shoot took two days and was done by the same folks who had worked with me in the past for the Small Room Decorating article. Gridley and Graves did a phenomenal job making my house look better in the photos than it actually does in real life. It was fun to have a fresh look at a place you know well through the eyes of another. As a kid my family and I always watched the This Old House gang on TV during Sunday morning breakfast. It was so much fun watching the transformation of these homes, seeing the attention to detail as well as the respect given to their individual character and history. Having my home featured by This Old House feels so very confirming of the work that I have done on this house over the past few years and I feel so humbled to have been asked to share my home with their readers. So now…. its pretty clear that I’ve been a little lax on the blog lately. To be honest, there is not much to share. I’ve done what I wanted with the house and gotten to a place where I feel comfortable with it. I’m proud of the work I have completed and I have learned a ton. I hope that this blog can severe as inspiration to others along a similar path. Unless my life circumstances change, I don’t really see further big renovation plans in the future here at the IBB. Its for those reasons that I’ve decided to sign off, at least for now. I feel successful in accomplishing the goals that I set out to achieve with both the house and this blog, most of the time I enjoyed the journey here and I’m so very happy with the results. I think its time I enjoy what I’ve got. I have really enjoyed following along. Thanks for the inspiration. Bradley, I’m not sure whether I am replying directly to you via email, or as a comment to your post. Regardless, I just want to say “Kudos!” What an exciting recognition for your oh so adorable bungalow. I will go to your blog when I get a chance, and comment further. 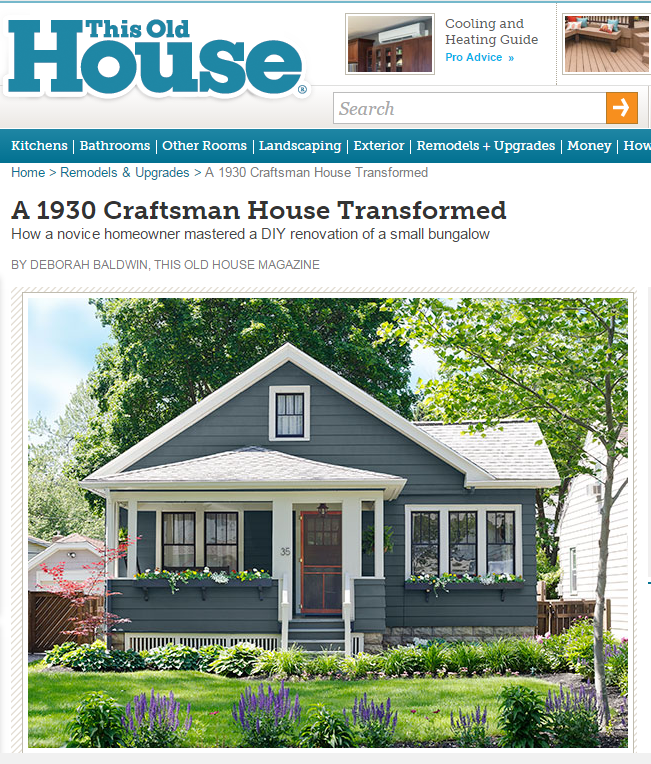 Will also be looking for This Old House on the newsstands! I remember how exciting it was to get the Small Room Decorating issue awhile back. Even though you don’t keep up the blog, will it still be available to peruse? As I mentioned before, I like to go to it for inspiration from time to time in my struggle to downsize and declutter. Also, before you sign off… did you ever give us a comprehensive look at your “mature” back yard/garage area? Congratulations! I have enjoyed the blog very much! Just got the Sept issue and your story/house was my favorite article! I love bungalows and I’m a big fan of smaller homes and admire your kind of can-do attitude. Exterior color: fab! Your age, attitude, style and house are so like my sons, I enjoyed the similarities. Passing along the mag to him and will read up on this blog (bummer you’re signing off, but understandable) Top notch! Thank you. Lovely job on your bungalow and saw the magazine article. One word of warning just in case your stove is not vented to the outside beware! I had the same exact stove in an unvented kitchen and it caused CO to buildup in the house which led to serious health problems. Chambers stoves are powerful gas machines. I don’t see a vent over it but you may have installed one after the pic was taken. I hope so. Symptoms are vague and can be hard to diagnoses – fatigue, lightheadedness, confusion eventually heart and brain problems. It is not to be taken lightly. Please don’t let this happen to you. Thanks Judi! I will look into this!